Year 4 Football Team took part in their first football Festival organised for 10 schools by Davenies. The mixed team had a successful afternoon remaining undefeated in their six games. 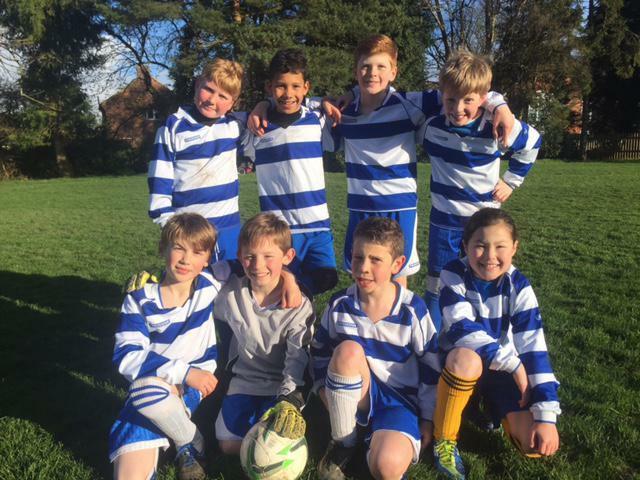 They started with a 2-0 victory over Prestwood, followed by a 1-1 draw with Little Chalfont, conceding with the last kick of the game. They then beat Danesfield 2-0 before a goal from Mina gave them a 1-0 victory over Chartridge. They finished the afternoon with a 1-0 victory over St Mary’s (Amersham) and a 3-0 defeat of St Peter’s. The squad of Thomas Ainger, Daniel Brosnan, Senan Conway, Tom Marsh, Harvey Maynard, Mina Sturaro, Ben Taylor and Dylan Youens then enjoyed the hot dog refreshments provided by Davenies afterwards.